by Klemke, E.D. 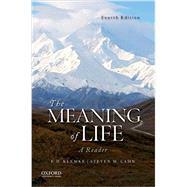 ; Cahn, Steven M.
Featuring twenty-five insightful selections by prominent philosophers, literary figures, and religious thinkers, The Meaning of Life: A Reader, Fourth Edition, serves as an ideal core text for courses on the meaning of life and introduction to philosophy courses where the topic is emphasized. In Part I the articles defend the view that without faith in God, life has no meaning or purpose. In Part II the selections oppose this claim, defending instead a nontheistic, humanistic alternative--that life can have meaning even in the absence of theistic commitment. In Part III the readings address whether the question of the meaning of life is itself meaningful. The fourth edition adds selections reflecting Buddhist and Confucian thought and also features a new Part IV on the end of life, raising issues about how our perspectives on death affect our understanding of the meaning of life. The late E.D. Klemke was Professor of Philosophy at Iowa State University, where he taught for more than twenty years. Steven M. Cahn is Professor Emeritus of Philosophy at the City University of New York Graduate Center. He is the author or editor of more than fifty books. Most recently, he authored Religion Within Reason (2017) and coauthored Happiness and Goodness (2015). Dr. Cahn is the editor of Exploring Ethics, Fourth Edition (OUP, 2016) and The World of Philosophy (OUP, 2016).